Wow what a weekend. It took a little longer than normal to catch up today. We had a 7 year old Birthday party on Friday night, make your own pizza’s was probably not the best idea for 10 kids 7 and younger, but they enjoyed it. Saturday night a Poker Tournament Fundraiser until 1:00 am, well past my, my husband’s and my son’s bedtime. Thank goodness Grandma kept the other kids so they weren’t up that late. We of course like many finished our weekend with our annual Superbowl Party on Sunday, just us nothing big. My son had to wake me at the end and tell me who won. Last week ended well but got off track right away on Monday. I basically began the week a day behind. So at the end of Monday I gave myself the choice to let Monday’s chores go or just continue on and see if I could catch up. I really wanted my room clean, I hadn’t seen the top of my dresser for awhile so I opted for continue on. I am glad I did. I can see the top of my dresser now with all the junk and dust removed and I would feel comfortable letting someone besides my kids use my bathroom. I didn’t get all the weekly chores done but I was less than a day behind at the end of Friday, even doing a few things not scheduled for the week. Having the party Friday night was little extra incentive to get the cleaning done. It’s always amazing how much more focused and how much faster I clean when we are having guests. Maybe I should have a party every Friday night. Since February is the month of Love. Along with working on my goals for a better home and house, I am also going to remind myself and my family of things we do well for the home and house. I seem to easily share my struggles and flaws maybe because there are many. But believe it or not, I do a few things right. Maybe if I look again at some of the things that work, I will see some ways I can apply them in other areas of my life. So keep your eye out this month I plan to share some simple things that I (or we) actually do right that give us a better house and home. Daily: Start and end each day with prayer. Read two chapters in the Bible. 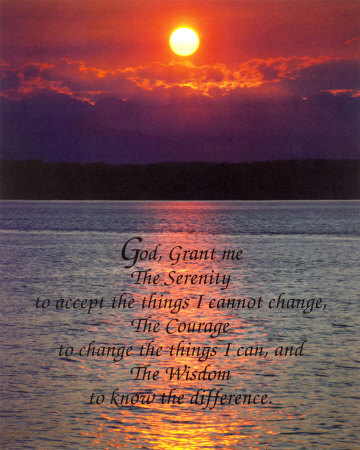 Pray the Serenity prayer every day this week. I have a few things I am struggling with. I pray about them but I still want to control them myself. Maybe this prayer will help me let go a little. It used to hang by my kitchen sink before we moved. It never made it back up since my sink is on an island now so I dug it out and will hang it by my phone for a reminder. Weekly: Read one article from the Leaven Newspaper and one chapter in Reasons to Believe. Run 5 days, I am going for it again, even though I didn’t make it last week. Monthly: We (some friends and I) will begin the “The Lambs Supper” book study on Feb 18. Weekly: Limit volunteering for the soccer league this week. I am going to leave this item for the next few weeks. This time of year (getting ready for the spring season) I can get sucked into spending entire days working on it and not making much progress. Daily: Give my family a proper send off and welcome home each day. Focused one on one time with each kid and my husband every day! Bible before bedtime prayers until Lent begins and then the Family Study will take its place. Monthly: Family study during Lent. Take my husband on a date; it doesn’t have to be on Valentine Day just sometime this month. Attend one Weds. Night Lent service with the family. 2. Weekly & Monthly Tasks, Chores and To Do Lists: Monthly Cleaning Schedule Schedule. The schedule is back on the fridge this week. I will continue to use these and try to accomplish more each week. I will also reintroduce the chore schedule we used in the past for my kids. 2013 Household Purge: I hope to finish this up in the next couple weeks. Tues: Boys Room (Clothes) we already went through toys over Christmas Break. Friday: No room scheduled, catch up if needed.